On a recent visit to Gabriola Island I had the pleasure of visiting the Woodfire Restaurant. This is a hidden gem run by a husband and wife team who present first-class food in a laid-back setting. As a party of three we were able to sample the menu offerings and judged all items to be excellent in quality and presentation. The eponymous pizzas are well crafted and the entrees and pastas were uniformly satisfying in all respects. Portions were ample and the dessert offerings are a serious temptation to overindulge. A well thought out beverage selection complements the menu and prices are reasonable relative to value. . A pleasure to visit and strongly recommended. We spend a lot of time on Gabriola and go to Woodfire several times a year. My wife has had many of the featured dishes and always enjoyed them, but since I had my first Woodfire burger, I never have anything else! I'm not sure what exactly makes it so good, but it is simply as tasty a burger as you'll find anywhere, served with excellent fries and a salad. Consistently satisfying dinner experience , I dine here about twice a month in the winter when I visit Gabriola for the weekend. The quality and presentation of the meals , the service and the atmosphere always make for an enjoyable time. The soups are especially good. Although I mostly eat alone here , I have been with 2 to six people and we have all had the same level of satisfaction. Unassuming restaurant in the main village area with contemporary decor, varied but not over-extensive menu. Food was phenomenal. Wife had a burger and I had a canzone. Burger was obviously freshly hand made on excellent foccacia bun. My calone was incredible with a slightly sweet dough and lots of filling. Service was very good. Will definitely return. Sophisticated ambiance and menu - ranging from gourmet pizzas to lovely fish, burgers, and pasta dishes. Great looking interior - contemporary with buffed concrete floors and attractive booths and tables. A real gem on Gabriola Island. You'll think you're dining in NY. Popular, so call ahead. Honestly, think this place is why the real estate market here is booming with Vancouver transplants. - and Americans from the East Coast! Great place! Excellent food! Amazing Service! Cold beer!! Bacon! You must go here. This is better food, colder beverages and better service than I have had in elite restaurants in many big centres throughout North America. Do yourself and EXTREME FAVOUR and go here. Get off your boat. Get off the ferry. Take your car. Whatever. Gabriola is an island. The road goes around it. You can't help but find this restaurant. IT WILL BE WORTH IT!! There were five of us. We each ordered something different and cross-sampled. All meals delicious. Our server was attentive, effective and very pleasant. What more needs to be said. This is one of the best meals I have ever had. It was a Valentines Day special menu. 3 courses and 3 or 4 choices per course. My appetizer was a salad and beef carpaccio that was decadent. Main was pork belly with fresh beans on a vegetable puree with an unbelievable demi-glace. Desert was a trio of different chocolate deserts that I was "almost" too full to finish. Friendly service, awesome food, and good value for how good the dinner was. The restaurant is beautiful & cozy with great staff & service. I can't say enough about the wood fired pizza and how delicious and unique it is. My husband ordered a 10" 'Decourcy' and I had the 10" 'Dragon's Keep'. Both were amazing and more than enough food… we were full. All the rest of the food that we saw being brought out of the kitchen also looked wonderful too. The owner and staff were all really friendly and helpful. If we lived on Gabriola island we would surely come for dinner here often! Having never been to Gabriola Island, but realizing it is a rather smallish community, I was not expecting much in the way of fine dining when I recently visited there. Well, the Woodfire proved me very wrong. Our waitress (Sharon) was charming, helpful and accommodating. My wife and I started with an amazing seafood chowder soup (for her) and the Charcuterie plate for me (this could be a meal in itself!). DW ordered the Pizza special of the day (spinach, chicken breast, grape tomatoes, pesto and roasted garlic, mozzeralla and brie). In a word...scrumptious. I had the panko and pine crusted halibut with roasted red pepper butter and sautéed vegetables. We couldn't do dessert and they packed up half the pizza to go (it was wonderful for lunch the next day). 2 pints of amazing beer and an outstanding Caesar cocktail for a $90.00 bill. Would love to return! Took visiting friends here for dinner - were they ever impressed! We can not say enough about the excellent quality of the food and service. Well worth a trip to Gabriola just for a meal here. This restaurant has set the bar very high for eateries on Gabriola Island or anywhere else for that matter. We have frequented Woodfire on several occasions and always found a stimulating variety of dishes to choose from and the food excellent. Whether we chose one of their gourmet pizzas, pastas or other entrees we have never been disappointed. They also have a great selection of wines to choose from. The service is professional and very friendly; the atmosphere cosy. We always look forward to our next visit and highly recommend this restaurant. Great selection of all kinds of DELICIOUS dishes and desserts. Exceptional service. A must anytime you visit the island. The "Woodfire" restaurant on small and quiet Gabriola Island was pleasant surprise in a rural, laid back, out of the way location. We had enjoyed eating there 3 months prior on our last visit so off we went. As it turned out along with many other hungry folks as the power was out on the whole Island (they have a back up). The small reception area was overloaded but the staff were up to the challenge in a very professional manner. We did not have a reservation so were given one for later which was perfectly fine with us. Our server was great, the food was excellent and the ambience very nice. We will go again and highly recommend it. We have eaten here many times over the years and have never been disappointed. The staff is always welcoming and attentive and the meals are predictably superb. They offer gluten free options and the staff is very knowledgeable on the menu adaptations to meet dietary needs. Side note. ...best TRUFFLE FRIES ON THE WEST COAST! Family friendly and take out orders too! Our fave place for special occasions! For many years, in another city, we went to a Valentine's special menu dinner. When we moved here there were no great choices for a nice meal out. Along came Woodfire. Yesterday for our Valentine's treat we had lobster ravioli for an app. 6 whole ravioli per serving. I truly wanted to lick the plate it was soooooo very delicious. We both had the baked cod with rice and veg.. Again, cooked to perfection. For dessert I had the trio of samplers. Poached pear, vanilla creme brûlée, frozen chocolate mousse. My husband had passionfruit cheesecake. ALL were fantastic. They make you feel special and NOT just on special occasions. Can't wait till our next visit! This restaurant is one of our many highlights when we are on Gabriola - we simply love the food & it would rate highly against any top restaurants! The Cioppino is the very best we have tasted! Along with many other dishes! The service is always great even when they are busy & they certainly can be but we never feel overlooked! Even though this is reviewed in September we have been dining at Woodfire for a few years & the standards have been excellent. The restaurant is very aesthetically pleasing, the food was amazing and our server was attentive, knowledgeable, but not overbearing. We arrived early so there was no wait and our choice for which table we sat at. The server gave us the specials from memory and answered a couple of questions we had regarding ingredients without missing a beat. Our server provided extra assistance to us to choose a couple of dishes and we were not disappointed. We loved the appetizers having the squid and a salad to share. Our main course were amazing, my classic burger was one of the best I have had and I was happy when they had the GF bun option. 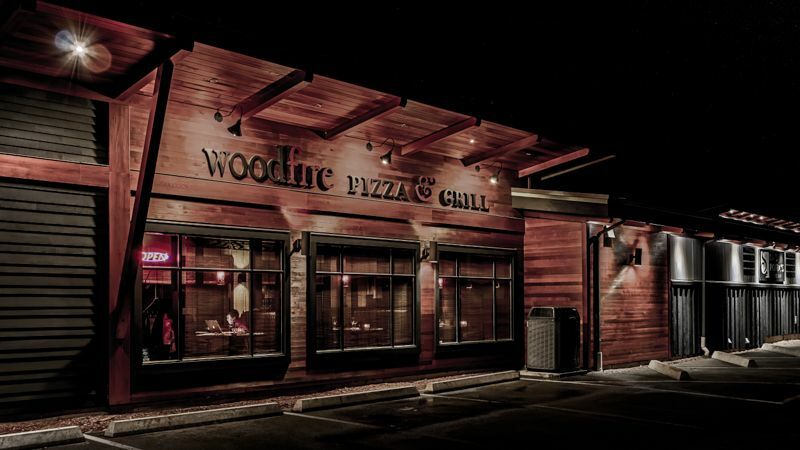 We had a great dinner and would definitely return to the Woodfire and recommend it to our friends! We debated about where to go for a special birthday celebration dinner and we're so glad we chose this restaurant. My sister has celiac disease and was thrilled to discover they make gluten free pizza. She raved about this pizza for days afterward. My husband and a friend ordered burgers and both thought they were exceptional. I had a pasta special that was also delicious. We'll take company here again.